Concept: This group represents mid to late successional tolerant hardwood Vegetation Types (VT) found on zonal sites within the Acadian Ecosite group. Representative species include sugar maple, yellow birch, beech, red maple and white ash. The shrub layer can be extensive, but it is the diversity and abundance of ferns that define the understory in this forest group. Bryophytes, if present, are confined to dead wood and lower boles of overstory trees. Vegetation:Vegetation types are closed canopy forests dominated by sugar maple, beech, yellow birch and red maple along with white ash, ironwood and (in western Nova Scotia) red oak. Scattered red spruce and white spruce are also common, while balsam fir can be a significant understory species. The shrub layer consists mainly of regenerating trees. Other common shrubs include striped maple, mountain maple, beaked hazelnut, fly-honeysuckle, hobblebush and alternate-leaved dogwood. Many fern species can be found in the herb layer, but typical species include hay-scented fern, New York fern, northern beech fern, evergreen wood fern and Christmas fern. Environmental Setting:Vegetation types in this group are found on a range of slope positions. Most sites are non-rocky, but surface stoniness can be variable. Soils are mainly derived from glacial till or colluvium deposits. 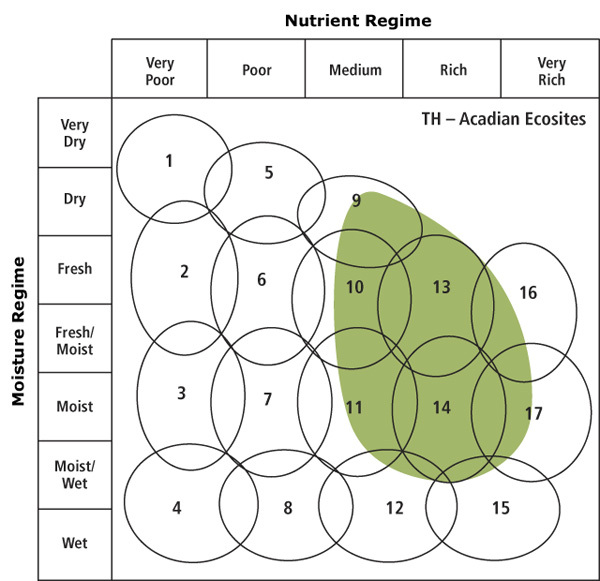 A wide range of moisture levels can be found, but most sites range from fresh to moist. Fertility is generally medium to rich throughout. Various VTs form the matrix forest in the Nova Scotia Uplands (300) ecoregion, slopes of the Cape Breton Highlands (200) ecoregion and in the North Mountain (920) ecodistrict. Some VTs also form small to medium patches in drumlin dominated ecodistricts throughout the province. This group is absent in the Cape Breton Taiga (100) and Atlantic Coastal (800) ecoregions. Successional Dynamics:This group is associated with mid to late successional zonal VTs. Stand-level disturbance events are rare and many VTs in this group will (or can) maintain themselves through gap replacement leading to uneven-aged climax forests. Two historic, province-wide disturbance events have influenced the current composition of this group. The introduction of beech bark canker circa 1900 has reduced the overstory prominence of this species and relegated it to an aggressive component of the lower canopy and shrub layers. Birch dieback in the 1940s decreased the abundance of yellow birch in the overstory and led to an increase in sugar maple coverage in some affected areas. Ecological Features: Tolerant hardwood forests are characterized by temperate trees and understory flora, high species richness, diverse stand structures and by generally rich and well drained soils. These large patch and matrix forests typically occur over hundreds of hectares and reach the northeastern extent of their range in Nova Scotia. They have a high potential to sustain old growth stands with complex dynamics supporting a wide range of age and size classes. Tolerant hardwood sites provide numerous microhabitats including: vernal pools, seeps, deep leaf litter and surface relief structures. Additional habitat features are embedded in the vegetation. Larger trees may have broken tops, hollow boles, cavities and rough bark; attributes that provide shelter, foraging, perching and/or growing sites. Vertical complexity is particularly important for aerial foragers and nesters, while other wildlife species are associated with patches of shrubs or ferns, conifer inclusions, deadwood, or with particular age classes or species. The typically fertile soils support many rare plants, while nutrient rich tree bark surfaces provide important bryophyte and lichen habitat.